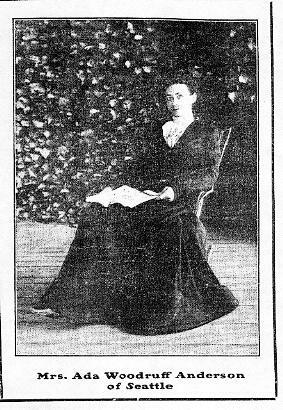 In a letter to Charles Buchanan, dated September 28, 1903, Ada Woodruff Anderson reminisced about her early days of teaching. “Teachers were not plentiful in the Puget Sound country then, and at sixteen I taught a summer school far up the Des Chutes and near the upper Nisqually.” For Anderson, “that was the happiest interval of my life.” For Anderson to remember, so distinctly, such a short period in her remarkable life is noteworthy. Her story is something one reads about in novels. 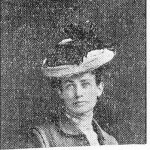 In fact, she would use her experiences in the area as inspiration and anecdotes for a series of novels she wrote in the early 20th century. Ada Woodruff was born in San Francisco in 1861. She was the daughter of Mary and S. D. Woodruff, the latter being a merchant engaged in the trans-Pacific trade with China. Shortly after her birth, the family, including brother Samuel, returned to China. There they lived in Shanghai. Smallpox broke out and it claimed Ada’s father. Mary and the two children, subsequently, sailed to the Puget Sound region, “while the news of the taking of Richmond made the slow journey across the continent.” This would have been in 1865. They settled in Tumwater at the house of her uncle, Nathaniel Crosby. Thus, by age four, Ada Woodruff had sailed across the Pacific twice, lived in China and California. Then, in 1865, a ship carrying her was docking at the small town of Tumwater, at the southern end of Puget Sound. Ada’s life on the waterfront and the frontier would become important themes in her writing. In 1873, twelve year old Ada was sent to California to attend to school. 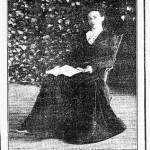 Once in California, however, she “missed the woods and mountains and that freedom of all out of doors.” When the teenage Ada returned to the Washington Territory is unclear, but her younger half-sister Maude Burr remembered attending school with Ada at the Masonic building on Main and Eighth in Olympia. Like many others in the era she was certified for teaching without a college education. One author described her as always remembering with “reminiscent pride” the teaching certificate she received from Rev. John R. Thompson at a ceremony in Olympia. Ada Woodruff’s life was a cosmopolitan one by territorial standards. Art, literature, music, and acting were incorporated into her dynamic personality. Georgiana Blankenship of Olympia wrote of her friend, “Ada Woodruff, a clever actress, was especially fine.” Like many women of her era, teaching combined caring with creativity. At age sixteen she set out to teach. When Ada wrote her letter to Buchanan in 1903, her description of the location of her school suggested a building east of Yelm that was probably not the building on the Yelm prairie, but one maintained by the Joseph Longmire family. On the other hand, in the Early Schools of Washington the author places her at a school on the Yelm Prairie. The year would have been 1877, a few years after J. C. Conine taught in Yelm and the railroad had pushed across the Yelm prairie on its way north. If I appropriate a small and tempered measure of your tribute it is with the conviction I have fallen very short in my memorials of these few heroes and pioneers. To my loss and regret I did not know Mr. and Mrs. Chalcraft personally. It was Mr. Anderson’s brother with whom Mr. Chalcraft had business interests; he, himself was always an office man. The close map work injured his eyes, and when he was forced to give it up, several years ago, he opened the photographic supply house on Cherry Street. Governor Pickering was a little before my time, but I have heard my uncle, Nat Crosby, speak of him. In those days the handful of people at Olympia knew each other intimately well. At the time my grandfather sailed up Puget Sound and anchored off Olympia, he bought the site at the lower falls of the Des Chutes, paying for it in thirty thousand Mexican dollars. My uncle, who was then a boy and helped to row the boat ashore, always finished the story with, “and I tell you it was a mighty heavy load.” It was here, at Tumwater, a brother of the captain built what must have been the first flouring mill on Puget Sound; and after the death of my grandfather, in China a few years later, my uncle Nat returned and settled at the falls. This was my first American home. My father, Capt. S. C. Woodruff, died also at Shanghai, before I hardly knew him, and I was brought across the Pacific while the news of the taking of Richmond made the slow journey across the continent. We, the news and I, arrived simultaneously, and the wooded heights around Olympia rang with cannonading. It was my delight to steal up the forbidden stairways of the mill to the top of the story, and watch the men hoist grain from the lighters that floated up under the walls at the flood tide. The four corners of the earth must have supplied that crow. There was one big foreign sailor who wore earrings, and sang a deep measure that thrilled my little soul. There was another fascination in the promontory over the bay; an Indian burial-place where the bodies in the treetops were screened by gay, hanging blankets. I did not understand their use bit the patches of color held my eyes. The Indians were my tillicums, and one squaw, who brought us berries in water tight, beautifully woven baskets, and haunted our kitchen for muckimuck and Boston gowns, named her papoose for me. September 28, 1903.Dr. Charles Milton Bunchanan. To Ada Woodruff Anderson, the Bald Hills were unspoiled forests, filled with sunset anointed vistas with the Olympics to the west and Mt. Rainier dominating the landscape from the east. In her dedication to her first novel, Heart of the Red Firs, she wrote: “To those few remaining pioneers, who knew the Nisqually trail into the great solitudes, in times before the logging railroad devastated the Puget Sound hills, and the wilderness began to recede at the coming of the builder of townsites.” The railroad had arrived in Yelm in 1873, only a few years before Ada’s stay with the Longmires. Yet, as much as this eden-like scene inspired her, she was quick to note the changes in the land. “A settler devastated whole areas of fine trees that could not be reproduced in a century.” Mountainous slash piles provided the tinder that could be ignited by “a match dropped in a dry place, or a burning fragment shaken from a pipe; embers left alive by a passing camper;” or purposeful burning conducted by farmers eager to make land agriculturally productive. “And those pioneers were so kind to me,” wrote Ada wrote in 1903. Anderson lived with the Longmire family. In her novel they would become the inspiration of the Myers family. She happily recalled, “One added a little room to his cabin for my use. It was built of cedar shakes and furnished with resinous bed and table of hewn fir, and the lock on my door was the only one in the settlement.” Nature impressed Anderson, but the people of the woods charmed her. There was a sense of community among these disparate cabins and farms. In Heart of the Red Firs men and women arrived to help build a new cabin. “People from Yelm and Tenalquet were there, and from Tacoma, in Pierce County beyond the Puyallup.” The experience was thrilling to watch. Men were ready to ‘match muscle,’ urging each other with dares and taunts to set their swelling chests and heaving shoulders to the heavy timbers. . . .The walls went up apace; the huge fir rafters were swung into position, and then appeared a wondrous gable, its sloping eaves arching a roomy balcony. Surely the settlement had yet to see as fine a cabin. The year following her time at Yelm, Ada moved on to the forks of the Snohomish to teach. This was, once again, the frontier, where “one white woman on the Snohomish, then, was much more unusual than the appearance of bears in the berry and fishing season.” She boarded with a family living miles from even the nearest logging camp. The frontier inspired Ada and provided her with memories for decades to come. It did not hold her. Ada returned to Olympia. It was during this time, however, that she ran a private school in the Elliot Hall, on Union and Main in Olympia. At the time of the 1880 census she was living there. She was identified as a teacher, but she reported that she was without work for six months in the previous year. Inspired by the scenes from her life and encouraged by her friends Ada she entered a writing contest and had a story published in Youths’ Companion. She also sent off a story to a San Francisco publication, The Lecture Room, and, again, won a prize for her efforts. This nascent writer, now entering her twenties, met Oliver Phelps Anderson during this time. Anderson, the son of one of the University of Washington’s early presidents, was the owner of drug store in Seattle. In 1882, they were married. Oliver Anderson soon established the O. P. Anderson Map and Blue Print Company while his new bride turned her attention increasingly to writing. Beginning in 1908, and continuing through 1915, Ada Woodruff Anderson was at her most prolific as a writer. Pulling together her experiences, life in the Pacific Northwest and Alaska, and applying her creative powers she wrote three novels, The Heart of the Red Firs The Strain of the White, and The Rim of the Desert. In her books Ada introduced the nation to the Pacific Northwest. Introduction: The following represent a selection of reviews of Ada Woodruff Anderson’s most successful novel, The Heart of the Red Firs, published in 1908. Mrs. Oliver P. Anderson, nee Ada Woodruff, known in the literally world as Ada Woodruff Anderson, is having great success with her last production, “In the Heart of the Red Fire.” This book is founded on the early day life of the pioneers of this country, when the settlements were few and far between, and Olympia was the metropolis of the Northwest, and the canoe and cayuse were the only means of transportation. The book is meeting with such success that it is difficult to obtain a copy, the booksellers disposing of all they receive from the publishers. This condition prevails not only in the West but throughout the East as well. Mrs. Anderson is an old Olympian, having conducted a private school here in the old Elliot hall at Union and Main streets for several years. Pioneers of the Puget sound country will probably say that the spirit of Western Washington has never before been interpreted in fiction as it has been in the pages of the Mrs. Ada Woodruff Anderson’s new book, “The Heart of the Red Firs,” published by Little Brown & Co., and placed on sale by Lowman & Hanford yesterday. The Seattle authoress, knowing from intimate personal knowledge the scenes of which she has written, has been able to depict much that is familiar to anyone with a year’s residence in the Western part of the state. To the newcomer, however, her book is equally interesting as an introduction to the many places and characters typical of no section of the country but this. Mrs. Anderson’s dedication strikes keynote of the work: “To those few remaining pioneers, who knew the Nisqually trail into the great solitudes, in times before the logging road devastated the Puget sound hills, and the wilderness began to recede at the coming of the builder of town-sites.” There is much of the pioneer life transferred with skill to the printed page, much of the changing conditions of the frontier, the building of cities, and there is a big story of business and political life woven through with the tinge of romance. The binding of the book is unusually attractive, wit a picture of Mount Rainier on the front cover. The Heart of the Red Firs. A Story of the Pacific Northwest. By Ada Woodruff Anderson. Boston: Little, Brown & Co. The great Northwest offers to the novelist a region hitherto but little explored. Its vast possibilities are more than suggested in this remarkably strong first novel by a writer native to the soil. Mrs. Anderson is already favorably known to Eastern readers by her short stories in the magazines. In this larger venture her ready pen, like the wand of magicians, has placed before us a vision of the grandeur and mystery of the lonely mountains, of the beauty and the danger of the forest. Not less at home upon the water, she describes with equal charm the adventures which befell the fine yacht Phantom, and with perilous crossing of the harbor on a stormy night in a lurching dugout. The life is almost wholly in the open, strong and free, and full of motive. Danger is everywhere, but it gives only greater zest to existence. And there is always the spur of ambition, compelling a man to do his utmost, be the cause of worthy or base. Of cities and towns little is said. The action follows the trails of the pioneer and prospector. On horseback and on foot the actors penetrate the country of the red firs, climb rocky fastnesses, or for swollen streams, and, when darkness overtakes them, find some sheltered spot in which to make their nightly camp. The few characters in the book stand forth in forceful personality. The heroine and her sister are types of a womanhood which represents the flower of Western civilization – its purity, strength and beauty. Paul, the childhood’s comrade and always lover of Alice, forms an admirable contrast to the unstable Phillip who is the husband of her sister. Even more interesting is the delineation of Mark Stratton, which is made with a masterly hand. His apparent inconsistencies serve but to emphasize the constant struggle in the dual nature of a man who has deliberately chosen to stifle every voice but that of self, and finds to his surprise how much more life might have given him had he followed as earnestly a nobler aim. For the story itself one must read the book, and it is not too much to say that it is worth reading and worth remembering. The Heart of the Red Firs: A Story of the Pacific Northwest. By Ada Woodruff Anderson. Boston: Little, Brown & Co.
“The Heart of the Red Firs” is a story of the Pacific Northwest in the days when the pioneers were settling the Puget Sound country. It is some what episodical as to narration, particulary in the opening chapters, the hiatus between the various events being strongly marked. Eventually the story works out into a more continuous tale and sequence of events and the story is found to concern itself with a shrewd and daring criminal, who is the head of a band of opium smugglers. But the interest of the story centers more in the principal characters than in the development or continuity of its plot, if so it may be designated. The author writes with a firm and strong hand in her descriptions of the regions roundabout Mt. Rainier, and there is an intelligent and discriminating depiction of the struggles and hardships encountered and overcome by the hardly frontiersman. In particular is there strong character portraiture and a heroine more self-reliant and resourceful has rarely, if ever, appeared in modern fiction. She is strong in executive ability, clear-headed and endowed with foresight and memory, yet she is not lacking in all the womanly graces and charms. It is no cause for wonderment that all the men fell in love with her. Even the desperate criminal came under the softening and refining influence of her true and pure womanhood. She is perhaps a man’s heroine, because of her masculine, fearlessness and indomitable pluck and will. The pictures of forest life are vividly drawn and the inspiration and uplift of the mountains pervades many of the chapters. The author evidently is a lover of nature in its most rugged forms, and the reader gets much of the stimulus of the free and open life of the woods in reading the graphic word paintings. The book gets close to nature. The characters are strongly drawn and the author even creates a sympathetic interest in the outlaw. There are many striking scenes, among which are a partial ascent of Mt. Rainier and the dramatic perils encountered, including a narrow escape from a tragedy; the raising of a cabin in the forest; a fight with a forest fire, which is another vividly dramatic narration; the night chase of yachts engaged in opium smuggling and the thrilling rescue of the hero from a landslide. The book will make especial appeal to those who have good red blood in their veins. Incidentally its idealization of womanhood is in refreshing contrast to those novels which have for their sole purpose the exploitation of the debasement of womanhood. All in all it is a book that is of many-sided appeal, one that will compel a second reading, because of its gripping realism. The illustrations call for a word of praise because they really illuminate the story. Ada and her husband spent their later years shuttling between their home in Seattle and at Port Blakely. Oliver died in 1941 and Ada survived him by over a decade. At this writing little is known about this era of her life. When The Story of Yelm was published in the forties, the authors and their informants remembered with pride the young woman who had taught at the little schoolhouse on the prairie. Funeral services for Mrs. Ada Woodruff Anderson, 95, of Bainbridge Island, author and member of a pioneer family, will be held at 3 o’clock to morrow in the Bonney-Watson chapel. Burial will be in Washelli. Mrs. Anderson died Monday in a hospital at Lynwood on the island. Mrs. Anderson was born in San Francisco. At the age of 3 weeks she left with her mother for China where her father, the late Capt. Samuel C. woodruff was in the shipping business. The family settled in 1863 in Tumwater, Thurston County, where Mrs. Anderson attended grade school. She went to San Francisco to attend high school. Mrs. Anderson wrote three novels concerning the Pacific Northwest. The last, “The Rim of the Desert,” was a bestseller. 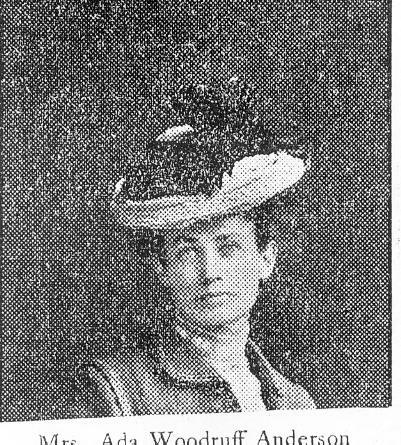 She had lived on Bainbridge much of the time since 1907. Surviving are a son, Maurice P. Anderson, Seattle; a daughter, Mrs. Alice Anderson McCully, Hawaii, two grandchildren, four great-grandchildren, and two great-great grandchildren.